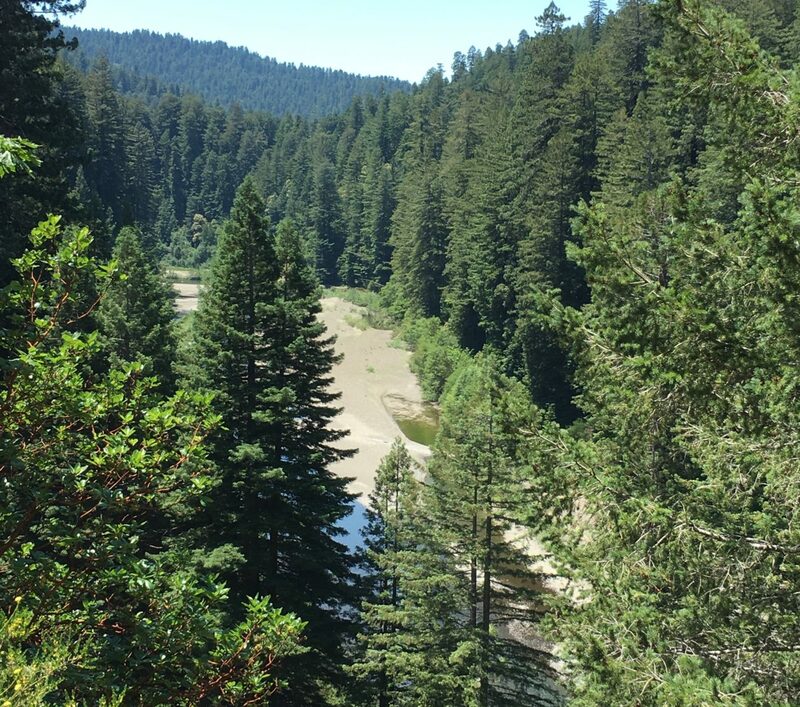 There is an association between alluvial flats built up from by stream flood deposits and tall redwood trees. The tall redwoods spread their roots through this nutrient rich soil, often in multiple iterations as alluvial soil builds up from flooding events over the centuries. However these streams are not an important source of water for these redwood trees. Instead high amounts of annual rainfall as well as year round fog drip provide the water for these giants. 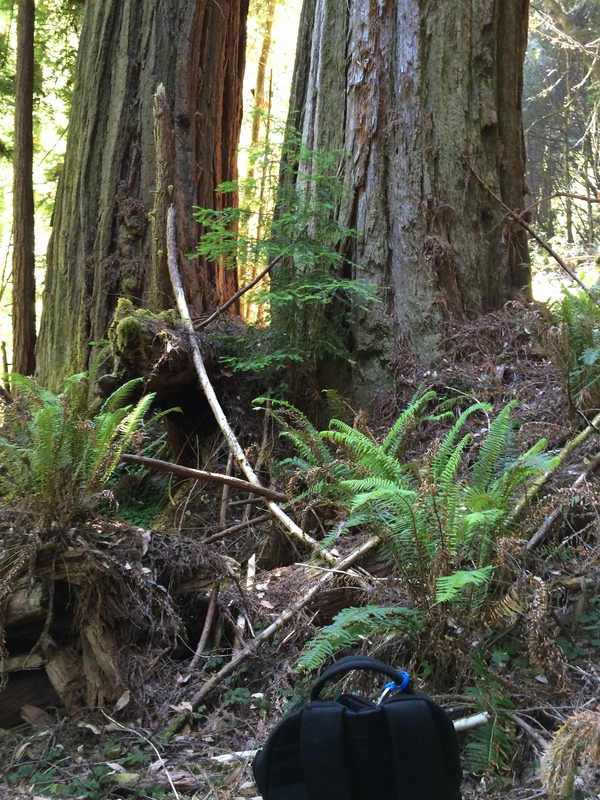 However there is another way rich soil can accumulate to support the growth of tall redwoods. If you have been on the hillsides above redwood creeks you may have noticed several things. First, the hillsides can be very steep, with gradients often between 20 and 40 percent. Second, there are convex (slightly bowl shaped relative to the slope) benches that occur at different elevations on these hillsides. Third, these benches have a dark, fine soil. That dark fine soil is called schist and when you stand on these benches you are standing on a pile of schist. Schist is great soil to support redwood tree growth. In the Redwood Creek Basin the soil on the hillsides (all of it) creeps about 2 millimeters per year and can also flow up to 200 millimeters during a very heavy rain event. The convex shape of the hillside benches induces the capture of the creeping schist soil. Presto, you have the perfect growing medium for a redwood. 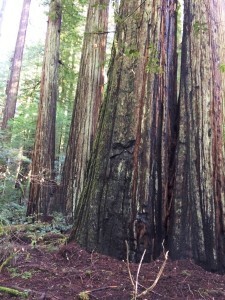 If a redwood grows on a schist bench in an area that is within reach of fog year round it can grow very tall. 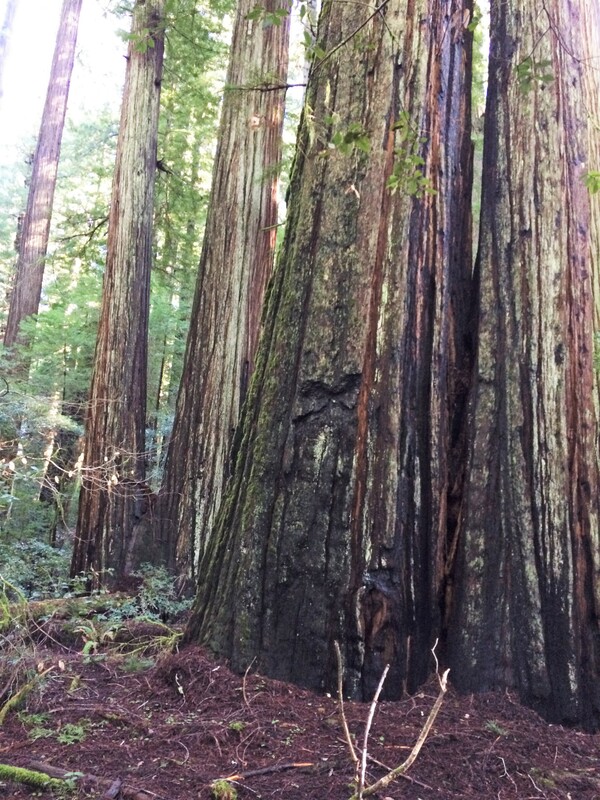 As tall as any redwood that grows in the alluvial flats. Hyperion grows on a schist bench. By all accounts Helios and Orion also grow on schist benches. Much of the alluvial flat soil is schist that has washed, flowed, or crept down the hillside, mixed with the flowing creek, and then left on the flats above the creek banks as the waters receded. To some extent this occurs every year during the transition from the wet to the dry season. One type of schist soil is called greywacke. 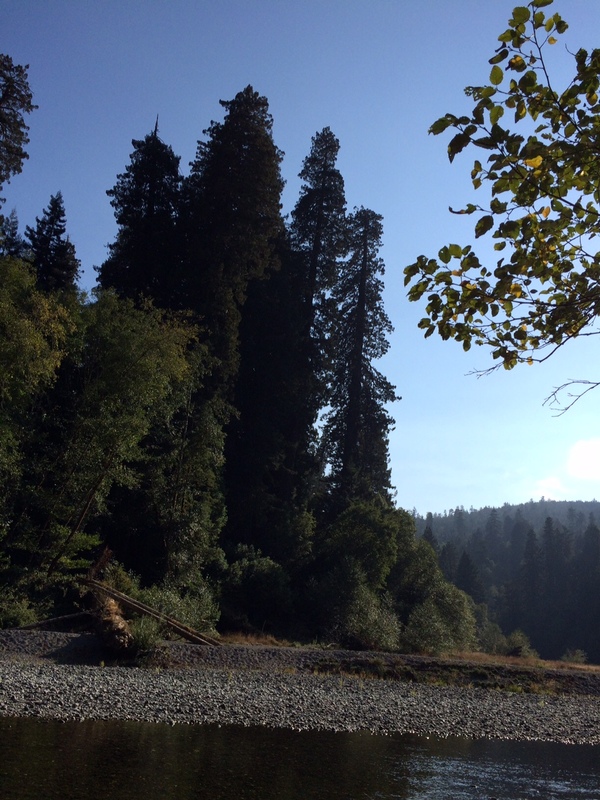 There is a redwood on the upper Bull Creek flats in Humboldt Redwoods that is named Graywacke after this soil type. A lot of geology is hard for me to follow but apparently the schist associated with northern California redwood forests was induced by tectonic fracturing and shearing of underlying bedrock. There is a tremendous amount of tectonic activity in the northern California redwood belt, as this is the location of the Mendocino Triple Junction where three large tectonic plates meet. There is a subduction zone a short distance offshore which induces giant (9.0 magnitude) earthquakes every 300-500 years (the last one was in 1700). Off the major faults are many minor faults, and the some of the notable redwood creeks follow these minor faults. Examples are Redwood Creek following Grogan Fault and Lost Man Creek following Lost Man Fault. The tectonic activity and associated periodic earthquakes have created the benches on the hillsides and contributed to the unstable nature of the soil formations. The soil formations then creep over time, allowing for the collection of the soil in the convex benches. Heavy rains induce the hillside schist soils to flow over the underlying bedrock. This can help the convex hillside benches “fill up” with soil as well as transport soil down to the creeks. Once in the creek the schist soil mixes in with the fast moving floodwaters. Then as the flood waters become less turbid and start to recede the schist falls out of solution and adds soil to the alluvial flats along the creek. Forests with tall redwoods need earthquakes and floods to thrive over the millennia. Diameter (or circumference which we recall from trignometry is pi x diameter). This is by far the easiest dimension to measure as you walk up to the trunk and use a tape wrap or rangefinder to do the measurement. Height. This can be difficult as the top of the tree needs to be hit at a distance with a rangefinder, then the height differential between the measure point and the point where the trunk meets soil needs to be determined. American Forestry Points: Trunk circumference inches plus height in feet plus one fourth average crown spread in feet. So here the crown spread has been added as an additional measurement to base circumference and height. Mass or volume. This is exceedingly difficult to measure and requires multiple measure points along the trunk as well as some kind of estimate of wood in the limbs and branches. Based on the overall shape of the redwood formulas for different geometric cone forms can be used as an estimate. When a tall redwood is on a hillside all these measurements become more difficult. For diameter the determination of average breast height (4.5 feet) measure point can involve some judgement as the point where the trunk meets soil can be ten feet higher on the up slope side of the tree versus the down slope side of the tree. For height the elevation differential between measure point and trunk elevation can become difficult. Many hillside redwood tops will measure around five hundred feet in height from a measure point on the flats but how high is the tree base above the flat? The GPS can become a little erratic on a remote forested hillside and GPS altitude readings are usually a little off. So even if you get coordinates right at the trunk that may or may not be correct for altitude. Also LiDAR has had its problems measuring trees on slopes. If a tree leans to the downhill the height will be overestimated. But there are also many redwood trees that lean a little uphill. This is due to the downslope buttressing seen in many hillside redwoods. Redwoods leaning uphill will have an underestimated LiDAR height. By the way, this hillside buttressing is an area of controversy in determining the ground level for hillside redwoods. Demonstrated LiDAR errors for redwoods heights are up to five percent. This would result in an 18 foot or so error for a very tall redwood. It is possible the tallest redwood is not Hyperion but rather a hillside redwood that has been missed so far. It is very easy to walk right by a tall hillside redwood. There is a chance a redwood or two growing out of a schist bench on a steep hillside slope could be taller than Hyperion. As one redwood explorer has commented, “chance has potential”. Harper Flat. 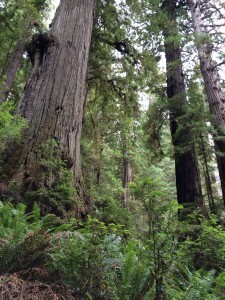 Even aged forest of tall redwoods with many fusions. 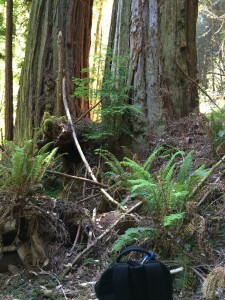 Fused redwoods are clonal sprouts from same roots that fused over time as the trunks touched and grew. Even age of stand and bias toward clonal propagation due to flooding event 1,000 years ago. Redwood National Park Tall Trees Grove. Iconic alluvial flats grove.